For Better Skin, Should You Eat Antioxidants Or Use Them In Skin Care? For Better Skin, Should You Eat Antioxidants Or Use Them In Skin Care? Morning loves!! I’ve been obsessed with adding as many antioxidants to my diet as humanly possible for months now and I’m digging the effects! I’ve also seen a huge antioxidant trend in the green beauty space and most of my favorite products utilize a few hero antioxidant plants. It can get a little confusing to know the best way to get those antioxidant benefits, but don’t worry, I did all the research for you and here are all the results! Antioxidant is a buzzword in wellness that’s about to get even buzzier. This umbrella term describes plant-based nutrients that keep us looking and feeling our best. But how? In this article I’m breaking down the importance and beauty-specific benefits of antioxidants, highlighting three of the top trending antioxidant-rich plants you need to know and letting you know what’s more beneficial: eating them or applying them directly to your skin. What is an antioxidant, anyway? An antioxidant is a molecule that stops the oxidation of other molecules. Oxidation is a chemical reaction that produces free radicals, leading to cell damage. That prolonged free radical skin cell damage can result in dreadful premature aging, unwanted beauty blunders, and eventually has the potential to cause disease. Millions of beauty products, supplements, and foods claim to give you that coveted glow from the inside out, but what is the best possible way to put skin-boosting antioxidants to work? What packs a bigger punch, a matcha latte or a matcha moisturizer? Is taking a turmeric tablet or rubbing a turmeric stick on your face the ideal way to reduce pigmentation? Can you even eat an aloe plant? I posed the question “eat vs. apply?” to the top antioxidant power players—matcha, turmeric, and aloe—and here’s what I found. When it comes to antioxidants, high potency and bioavailability are two factors that determine how truly effective each substance is. The trick is knowing how much of the active antioxidant-rich ingredient is in a product and how easily and readily our bodies can utilize it. Also known as Camellia sinensis, is a species of evergreen shrub. It’s been “a thing” in Asia since 2700 B.C. and is now served by baristas with pink hair everywhere circa 2016. Matcha is an anti-inflammatory Zen master. Its unique antioxidant properties make it the perfect antidote to a late-night greasy meal. Matcha’s most noteworthy antioxidant, EGCG (epigallocatechin gallate) is a flavonoid that suppresses the inflammatory processes and is extremely bioavailable when ingested in green tea form. Long-term studies demonstrate that EGCG contributes to inhibitory effects in the skin, such as antioxidant, anticancer, and anti-inflammatory. Ippodo matcha powder from Kyoto, Japan, is a 300-year-old pure tea that’s just about the highest potency money can buy. The manufacturing process simply entails slow grinding fresh green tea leaves until matcha powder is formed. Use this green gold in smoothies and tonics. Also known as Curcuma longa, turmeric is a rhizomatous plant of the ginger family. It’s so hot right now and, yes, will stain your white chucks. Turmeric is the magic marker of antioxidant-rich plants; its hero ingredient is a volatile yellow oil called curcumin. Curcumin can help reduce pigmentation, fight acne, and even out skin tone. 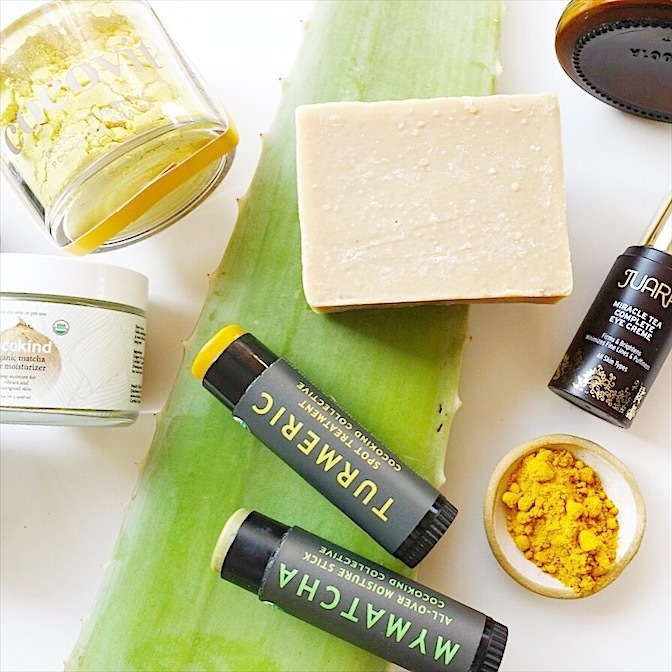 Turmeric’s polyphenols have been shown to possess anti-inflammatory, antioxidant, wound-healing, and antimicrobial action, perfect for reducing skin blemishes and fading any scarring they may leave behind. Turmeric and its powerful properties have visible skin clearing results when applied topically to troubled skin. Bioavailability is, however, greatly reduced when ingested due to rapid metabolism and rapid systemic elimination of curcumin in the GI tract. Cocokind turmeric spot treatment is an all-natural turmeric spot stick that conveniently treats scarring, pigment, and acne with organic turmeric as one of the top ingredients. You can see, smell, and feel the turmeric’s potency in the product. Ranavat flawless veil mask clears complexion with powerful raw powders including Organic Wild Turmeric to uncover fresh skin and help kiss hyper-pigmentation goodbye. Also known as A. barbadensis miller, is an evergreen perennial. It thrives in tropical climates. Aloe is our anti-aging comrade. It prevents skin aging by stimulating the proliferation of new cells and increasing collagen synthesis. It also calls upon its antioxidant powers to fight free radical damage and degeneration of tissues, keeping skin looking radiant. Topical administration of aloe gel directly reduces free radical tissue disruption through various biochemical pathways. The high concentration of antioxidants C, E, and unique enzymatic antioxidants protect skin from environmental elements including sun, pollution, and other environmental stressors. 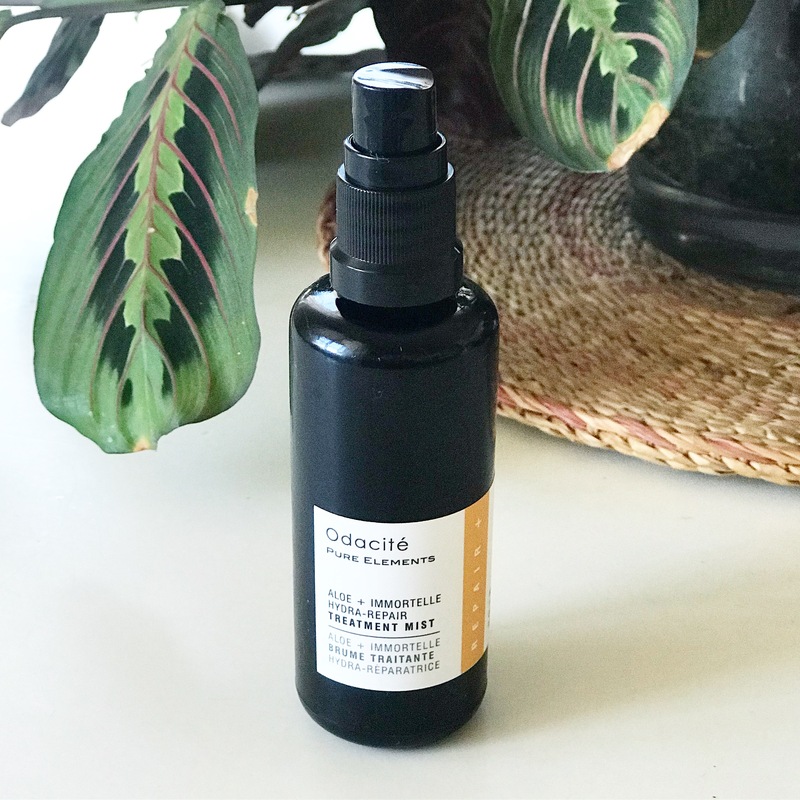 Fresh aloe vera juice is the first ingredient in Odacite’s aloe & immortelle toner, which is conveniently in a spray bottle, allowing you to directly infuse your skin with the anti-aging properties of aloe without any toxins. 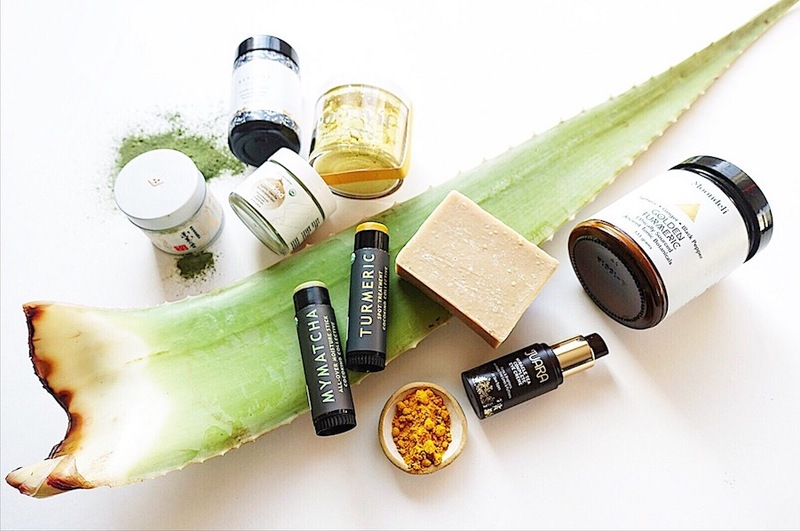 Getting back to nature’s antioxidant basics is the foundation of currently trendy beauty ingredients for a reason—the chemical compounds found in plants have profound effects on skin! She’s a wise one, that Mother Earth. Let’s utilize these findings to put her plant alchemy to work in favor of our best health and best skin in 2018.